A dental crown is a fixed dental device (sometimes called a “cap”) that is cemented onto a damaged natural tooth. It can also be attached to the metal rod of a dental implant. It protects and gives utility to existing teeth or implants. Dental crowns can protect a tooth that has been badly damaged by tooth decay. Crowns can be particularly useful for large cavities, for which they can prevent the necessity of having to perform a root canal. Restore a tooth after a root canal. If you do have a root canal, a crown can be placed over the root canal to return that tooth to its function. Hold together a severely cracked or broken tooth. Crowns protect weak teeth and prevent the need for their extraction. A crown can turn a broken tooth into an attractive ‘new’ tooth! Protect a worn tooth. 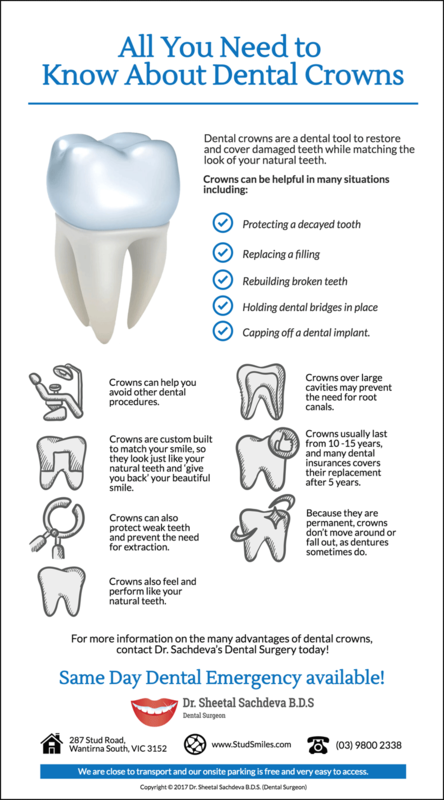 A crown can restore a tooth it’s original strength and function, and save it from having to be extracted. Anchor a dental bridge. Crowns can be placed on teeth adjacent to a missing tooth, and hold a permanent dental bridge in place. Dental crowns go in your mouth and stay there! Because they are permanently placed in your mouth, they do not move or slide around. Once crowns are in your mouth, they don’t budge! Crowns last a long time! A crown can last from five to ten years and some last even longer. Check your dental insurance, because it may include free replacements of crowns more than five years old. Dental crowns can help with a variety of dental issues. Visit Dr. Sheetal Sachdeva Dental Surgery to learn more! Dr. Sheetal Sachdeva Dental Surgery provides high-quality dental crowns in Wartirna South. PreviousPrevious post:Top 4 Dental Tips During PregnancyNextNext post:Gums Tender Or Bleeding? It’s A Problem!